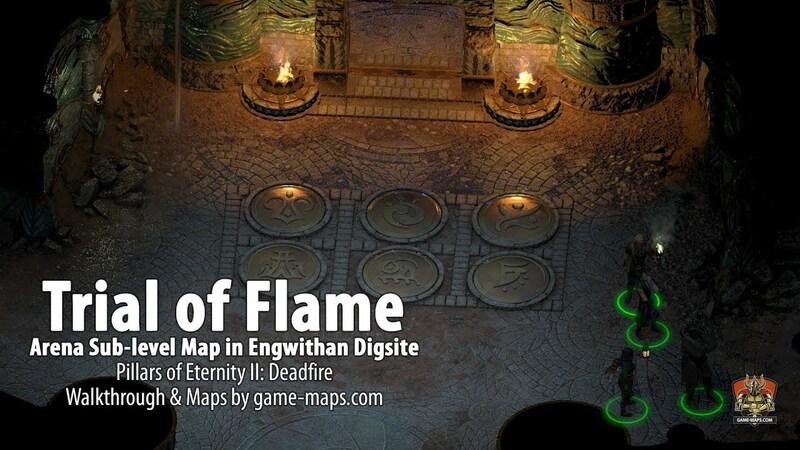 Arena Sub-level Map in Engwithan Digsite, location in Port Maje Region in Pillars of Eternity II: Deadfire Video Game. 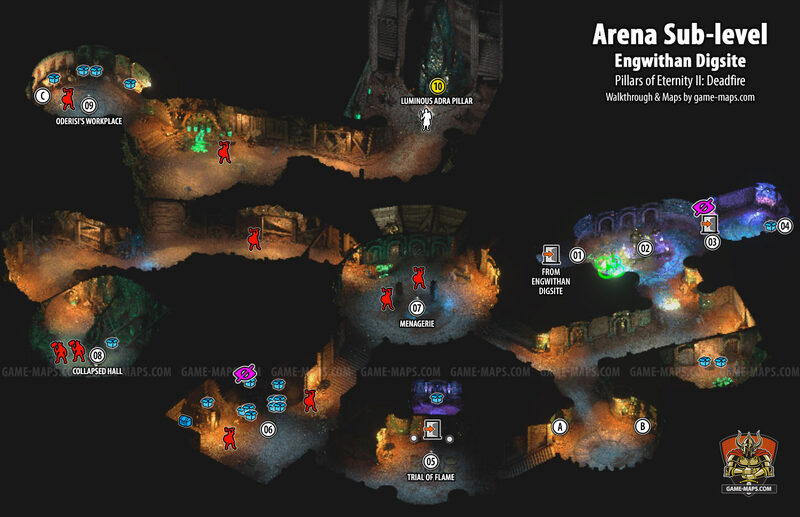 Arena Sub-Level Map in Engwithan Digsite for Pillars of Eternity II: Deadfire. Light two braziers near closed doors. Press plates on the floor. Left-upper, left-lower and right-upper. You can find symbols for this puzzle in (A), (B) and (C). Through a massive adra pillar within the Engwithan ruins, I was able to forge a link between myself and Eothas. I managed to retrieve the fraction of my essence still within him, but Eothas severed the connection before I could do much else. He seemed to be drawing power from the luminous adra. If this is how he is powering his journey across the Deadfire, then finding more adra pillars may lead me right to him. Return to Governor Clario with news that Oderisi is dead. The Hunt for Eothas - main quest line. Eothas is drawing essence from the pillars of luminous adra in the region. Whatever he means to do with all this power, tracking down these pillars may be the only way to pick up his trail. Locate more pillars of luminous adra. Reach the city of Neketaka. Reach Kahanga Palace in the Serpent's Crown district. The Vailian Trading Company has a vested interest in locating luminous adra. Governor Clario may be able to point me in the right direction. I've learned that Eothas has made another appearance, this time on the outpost of Hasongo. I wore out my welcome at the palace. For now, I have only a name to go on: Hasongo. Having heard my report from Hasongo, the queen invited me to speak with her in private, on the roof of the palace. I picked up Eothas' trail at Magran's Teeth.